Fall colors in Northern Minnesota get so much hype every year. 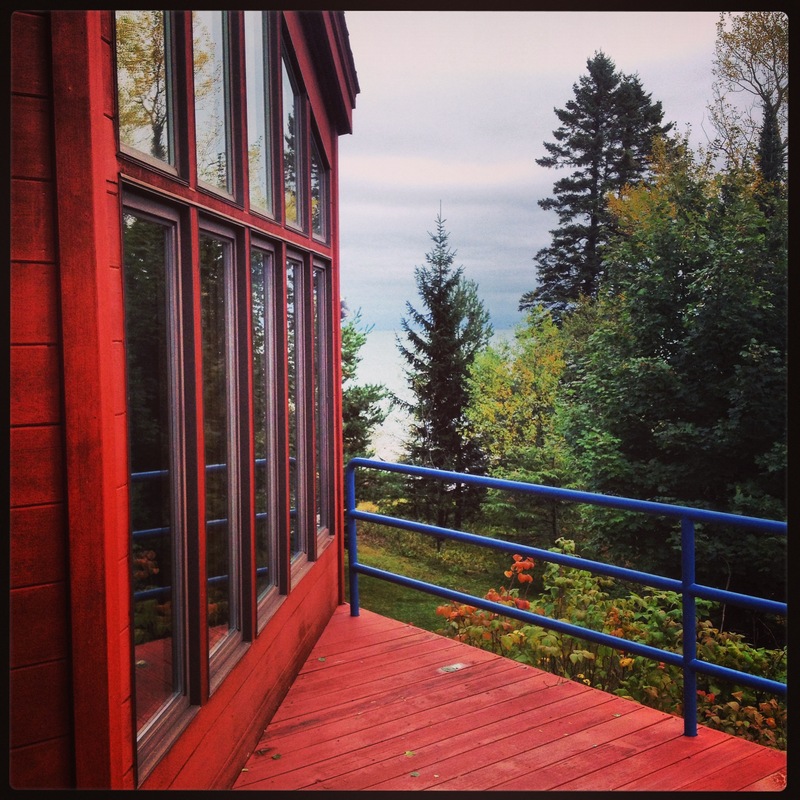 So when we had the opportunity to travel early October to TwoHarbors to stay in a private home, courtesy of a very generous client of my brother’s, we hopped on it. 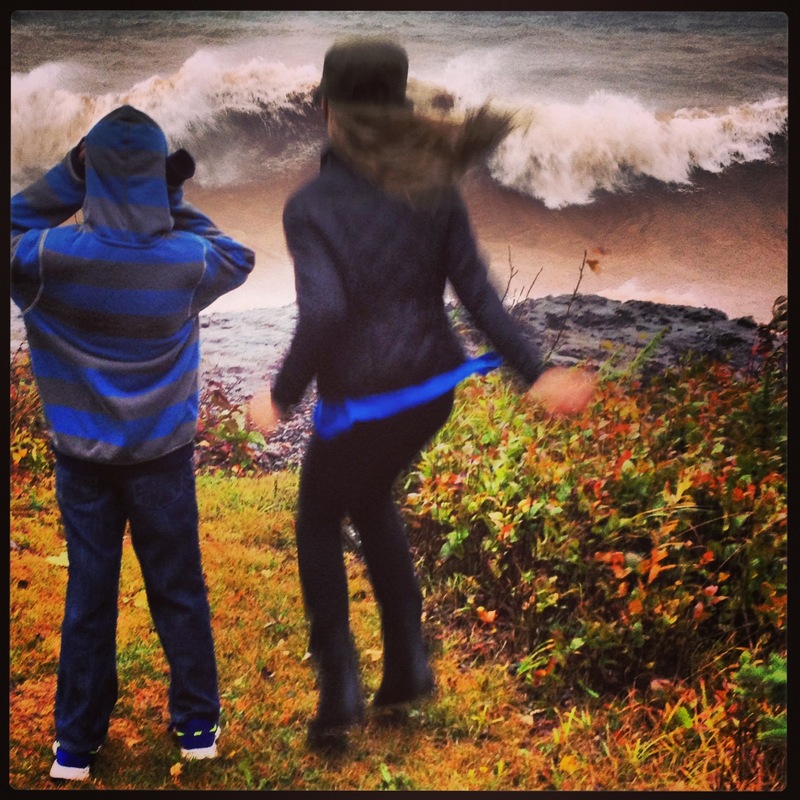 Our trips to the Lake Superior shore Minnesota side have typically been in the summer (Backdoor Exploring blogpost) and winter, both recent trips were to Lutsen. Car one – my parents, brother and sister-in-law and their 8 month old – went up Thursday eve of the first weekend in October. Car two – our family of four – drove up Friday afternoon. The weather didn’t look to particularly promising, so we left the golf clubs behind in favor of board games. Our home away from home for the weekend was in TwoHarbors right on 440ft of lakeshore with a long winding private drive. Luckily it is a year-round home with heat and a fireplace – much needed for a chilly fall weekend. The first crew visited Gooseberry Falls on Friday, while we were still in the Twin Cities. It was the best day weather-wise. When we arrived around 7:00 on Friday night, it was pitch black. You could hear the waves crashing, but see nothing of Lake Superior. Needless to say, the kids, Ava (10) and Calvin (8) were pretty blown away the next morning by the views and rocky shoreline. Winds reached 45MPH out of the NNE that day which made for huge, crashing, ocean-like waves. A few times, they caught us of guard and had us retreating pretty quickly! On Saturday, my husband made omelets with everything – and I mean everything from steak to sausage and all the fresh veggies from gardener friends we toted with us. After brunch, it was misty and overcast so our plan to visit the Glensheen Mansion in Duluth, haunted in murderous mystery, was an eerily perfect choice. We arrived by 12:15 and watched a few of the historical videos in the gift shop before our 1:10 tour. We opted not to do the expanded 1.5hour tour that included the boys’ floor and attic, where Elisabeth, the heir to the estate, was murdered in 1977. Waves Crashing, Coming Closer, Run! The kids thought we were en route to a Haunted House, like the one at the MN State Fair, so we had a lot of explaining to do. The tour mentioned nothing of the murders. Most of us had read Glensheen’s Daughter, the story of Margorie Congdon, the adopted daughter of Elisabeth Congdon. It had been years though, so we refreshed our memories by paging through the book in the gift shop, by Minnesota author, Sharon Darby Hendry, a family friend on my husband’s side. We thoroughly enjoyed the tour — it really transported us to a different era. Built between 1905-1908, the home had not only the best technology available in its day, but the most humane and equal treatment of servants. After the tour, we headed into Grandma’s Sports Garden for the 2:30 Gopher game. It was only fair after the guys endured the home tour, maybe not their first choice. The weather was fierce as we left to head back up to Two Harbors. We decided to stay in make a fire and order pizza from Do North Pizza. Good stuff especially because they delivered. Later on, indulging in Betty’s Pies and a heated game of Cranium, we had an experience worth a Yelp review (Perfume Pie). After a pancake breakfast Sunday morning, our crew split up. 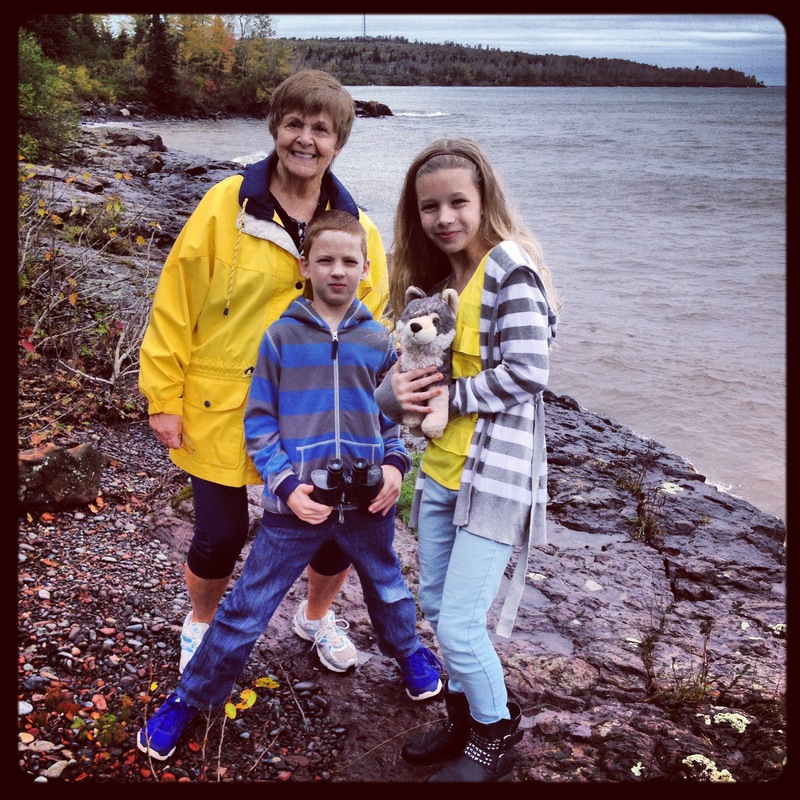 Our family of four visited Gooseberry Falls and the rest of us drove up the shoreline to Splitrock Lighthouse. We met back at the house late afternoon and packed up to head back to the cities. The skies brightened a bit on the way home to take in some peak fall colors. I would much rather have been out walking among them, which we did a bit of at Gooseberry Falls. With all of our indoor time, we did check out the homeowner’s vast collection of historical books while Calvin studied the map of Lake Superior and shipwrecks of the past, including the Edmund Fitzgerald. 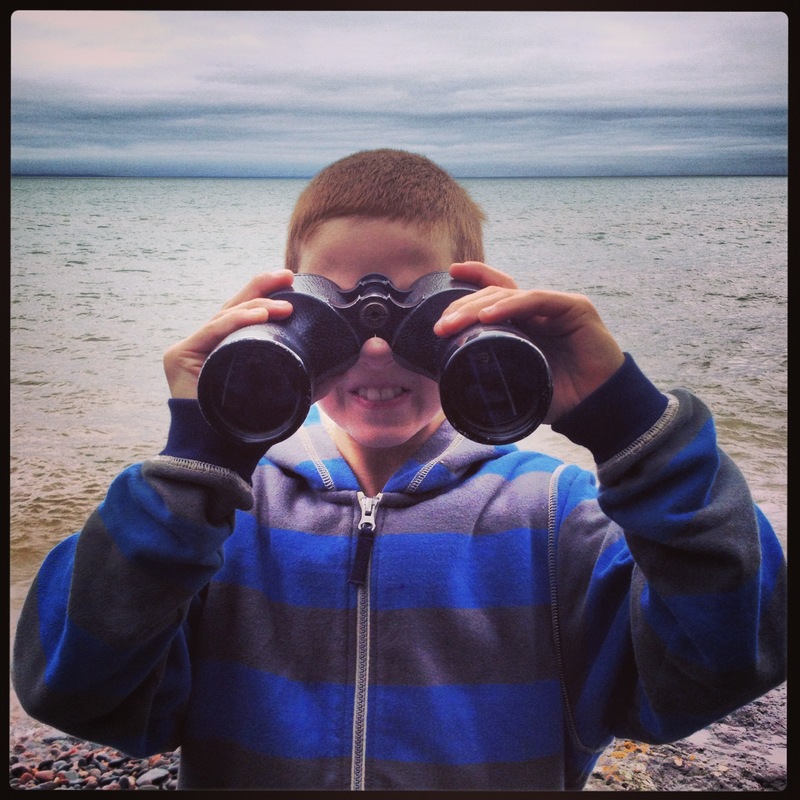 The kids were intrigued enough to want to plan another vacation to the lake next summer – potentially the Apostle Islands. (I did post some #fallcolor finds on Instagram as part of Explore Minnesota’s Instagram campaign #ExploreMN and a quick Vine video). I am want to find another fall weekend to visit where the viewing pairs nicely with warmer weather – maybe fall of 2014!